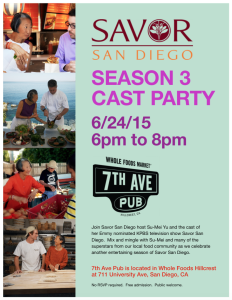 Season 3 Savor San Diego Cast Party! Mix and mingle with Savor San Diego host Su-Mei Yu and the rest of the Season 3 Cast & Crew Wednesday, June 24 from 6pm to 8pm at 7th Ave Pub in Whole Foods Hillcrest. This is a fun and unique opportunity to meet many of the show’s featured guests, Su-Mei and the rest of the crew. The event is free and open to the public. 711 University Avenue, San Diego, CA 92103.